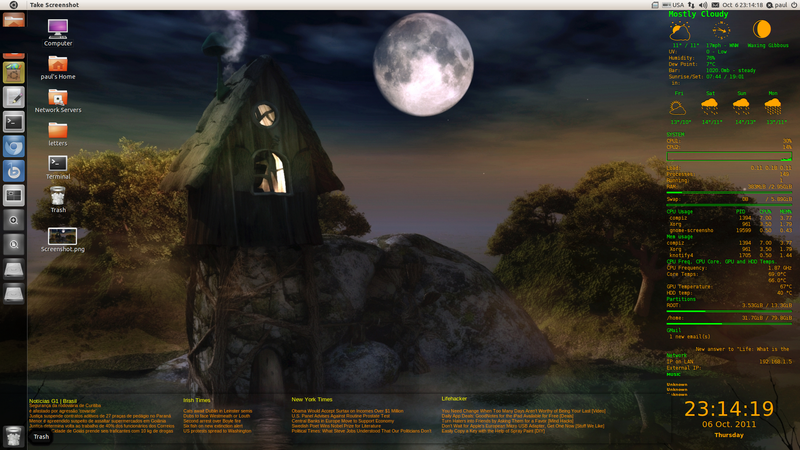 I added these newsfeeds to my conky display in Ubuntu 11.04 with the help of this post which is in Portuguese. I essentially just copied the .conkyrc from the link, substituted my preferred news sources, commented out the fifth news source in the link as I only wanted four. Then I had to increase the minimum_size (last line before TEXT) to "minimum_size 1600 0" which is what I need for my 1950x1080 screen. But now I had two .conkyrc files; one for my previous conky output (weather, computer operating variables, music and Gmail) and another for my rss feeds. -- the rss headlines are great but they are not expandable, or I can click on the headline and get more detail. This is awkward but I will be able to overcome this by just creating a browser page which provides linked versions of the conky output which I can go to if any of the headlines interest me.